An unabashedly bro-y YouTuber who makes money by posting videos of his dumb bro-y antics nearly killed himself in his latest dumb video. Jay Swingler teams up with his friend Romell Henry to post videos under the name TGFbro. While TGFBro is known for videos of the two men, both in their early twenties, playing with explosives and sitting in tubs filled with everything from chili sauce to fake tanner, the duo recently developed a penchant for construction binding material. 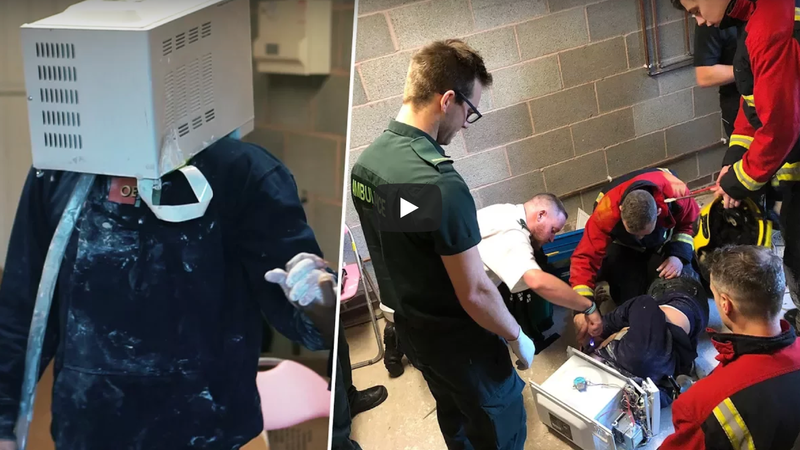 In the last few weeks TGFbro have produced videos of the two men putting their bodies in tubs filled with concrete and expanding foam. But for their latest video, Swingler took the experimentation to a whole new level of idiocy when he put his head in a microwave and filled the appliance with Polyfilla, a spackling paste that’s supposed to fill holes in walls. To be “safe” (nothing about this is safe) Swingler included a flimsy breathing tube. But that tube became blocked as the material hardened and expanded, and Swingler began to panic, which no doubt made him require more oxygen. His friends attempted to dismantle the microwave and chip away around his head using a knife (!? ), but thankfully called emergency services before Swingler suffocated to death. Firefighters and EMS came within minutes spent about an hour chiseling and cutting the heap of plaster and metal in order to free Swingler’s head. Despite the thanks, West Midlands Fire vented their frustration on Twitter. Swingler did not reply to a Gizmodo request for comment about how much he expected to make from the video, which seemed to have already racked up almost a million views before the video was demonetized. That’s probably enough to make several hundred dollars.